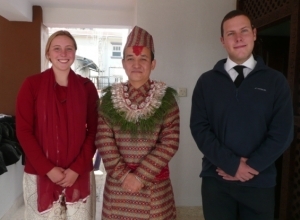 Chris Wagstaff has just completed his 4 month volunteer teaching programme in Nepal with Oyster Worldwide. 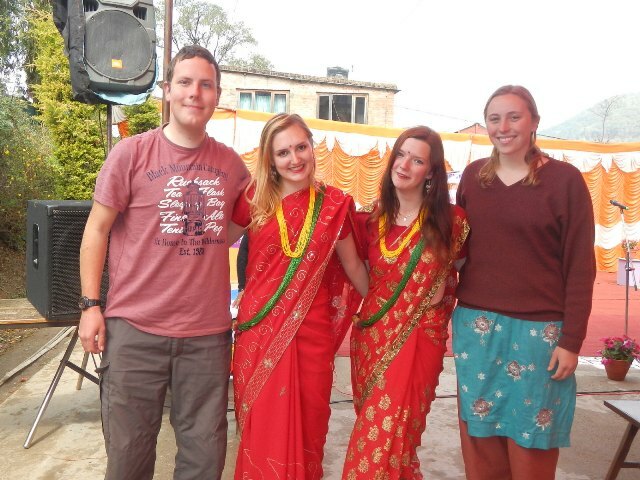 Chris had an amazing time on his gap year and has written about his typical day as a volunteer in Nepal. Enjoy! “I taught in a school just outside the village of Lubu in the Kathmandu Valley and lived with Rajan Chand, his wife Susma and son Sissir. Rebecca, another Oyster volunteer, lived with another family in the village and we taught at the same school for three months. On a typical day I’d wake up around 7:30 and head out for a shower in the concrete “shed” just down from the house. I’d eat breakfast with the family around 8:15 (Dhal Bhat of course!) and we’d share our plans for the day. Soon after breakfast Rajan would leave for work and Susma would take Sissir to the bus stop and I’d leave the house around 9:00. I’d walk down the hill to Rebecca’s house and we’d normally have a quick talk in the sun whilst waving to the kids on their way to school. We’d leave for school ourselves around 9:30 and walk the five minutes along a dirt track to school, passing farmers on their way to and from their fields. At school we’d talk to the kids in the playground until assembly at 9:50. Here they’d say the morning prayer and sing the national anthem before classes began. Rebecca and I each taught three 40 minute lessons a day, I’d teach classes 5, 6 and 7 (mainly 11-13 year olds). In-between lessons I’d spend time in the staff room to mark books, mark tests and plan the lessons for the next day. If it was a warm day Rebecca and I would sit out on the balcony in the sun with our work. When I wasn’t marking I’d normally have Rebecca to talk to, we’d talk about our travels or what we’d fancy doing at the weekend through to what was going on in our host families. If the other teachers were there we’d talk to them and if our coordinator teacher, Ragaram, was there he’d ask us how we were doing and what we’d been up to in our lessons. School finished at 4pm and we’d walk back towards our home with some of the students in tow. We’d help them with their English and in turn they would help us learn Nepali. Back at home I’d get changed and read or write my diary for a little while. Sissir would get home around 4:30 and if he had any English homework I’d help him with that if he needed it. Sometimes we’d play football or volleyball in the front yard, occasionally some neighbours (young and old!) would join in and then stay for a cup of tea before dinner. We’d normally eat dinner between 7 and 8 but I’d go up to the kitchen about half an hour before to spend some time with Susma and watch her cook Dhal Bhat (lentil soup with rice) and whatever curry we’d be having with it, anything from cauliflower through to potato and chickpea. Although I did get lucky sometimes, some nights she’d make homemade roti (bread) with cabbage curry! Whilst Susma was cooking I’d muck around with Sissir or we’d all just talk, they’d ask me questions about my life back in England or my family whilst they’d tell me about life in Nepal. We’d finish dinner around 8 and then we’d all head off to bed around 8:30. This was a typical day but some nights we would be invited to a party or a neighbours for dinner. On days off and public holidays (of which there were many!) I’d often head down to Rebecca’s house to play cards or get involved with her family. On a few occasions, we all spent whole afternoons together making Momos from scratch and then enjoying a good few of them for dinner. Thanks very much for this Chris, we’ve all enjoyed reading this in the office! To take the first step in experiencing your own ‘typical day in Nepal’ check out our Nepal teaching and childcare webpage and book now..
Next Post Introducing Oyster&#8217;s volunteering with monks in Laos programme!